* Create plain and encrypted disk images using one of the following file systems: ext2, ext3, ext4, FAT-16, FAT-32, HFS, HFS+, NTFS, ReiserFS and XFS. * Create encrypted volumes from physical disk drives. 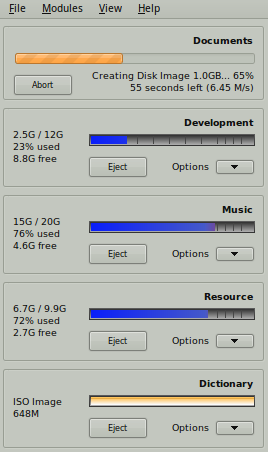 * Mount system partitions and virtual disks from the GUI or command line. The source can be plain or encrypted. List of supported file systems is O/S dependent. ISO images are widely supported. * Copy to clone devices and disk images. * Supports all ciphers and hash algorithms provided by the operating system. This will install all the required files. Sounds good, but has there been a security analysis of this product, its methods and encryption algorithms to ensure that it does what it says it does? With all due respect to the people who wrote this, there are many examples of encryption tools which have many holes in them. Is it as good as Truecrypt? 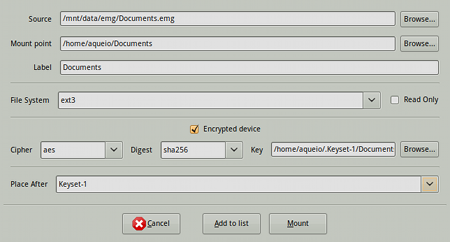 The program uses cryptsetup with LUKS extension for encrypting disk image files/physical disk drives. Therefore the usage of encryption algorithms is safe and probably faster than Truecrypt. The program does not implement or directly use any encryption algorithms. The password prompted when mounting an encrypted device is immediately deleted from memory and never stored in the disk.